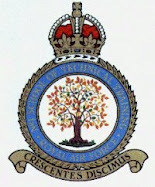 139 Entry - RAF Halton Apprentices: Swinderby - pre-Appo times . . .
Swinderby - pre-Appo times . . . 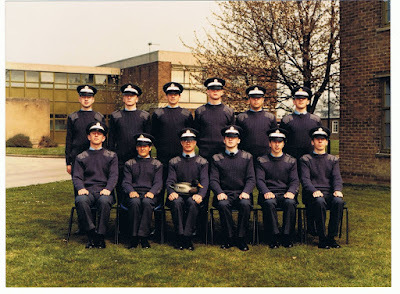 This picture from Dave 'Spike' Ball shows his 'room' (for that's how were were organised at the time, if I recall correctly) in an 'official' photo, all shiny and new in their new uniforms. I'm guessing this was close to our passout from Swinderby, where we did recruit training (boot camp). We'd all be around 17-18 years old. There were different trades in the 'intakes' of Swinderby, not all were destined to be Appos. We were housed in 18 man rooms in the 'H' blocks - named because of their shape when you looked down from above - and it was a rather emotive name given it's association with the prisons in Northern Ireland where terrorists were held! There were two floors and 4 rooms per floor. A number of recruits were still recovering psychologically from the severe haircuts we received 6 weeks earlier on arrival. But by this time we were getting used to the ways of the RAF. According to Spike "Life was easy then because all you had to do was what you were told to do! I seem to remember that Elford and Purser were still recovering from the haircuts of their lives!!" Mind you, Spike looks pretty relaxed in this shot. Lack of sleep from those 'bull nights', probably! Click on the picture to see larger version. Anyone remember the relevence of the wooden duck in the front and centre?? I think it was because our flight corporal (drill staff) was Drake. Funny how these memories come back. I can recall his face shouting at us and the rather rotund sergeant we had. What was his name? A quick look at who we have here . . .
front l-r: Ball, ? ?, non appo, non appo, Purser, Elford.